A short while ago I was contacted by the lovely team at McArthur Natural Products to try out a selection of face, body and hair care products. As I have now been testing these products for several weeks I thought it was now time to share my thoughts and a bit about the company! 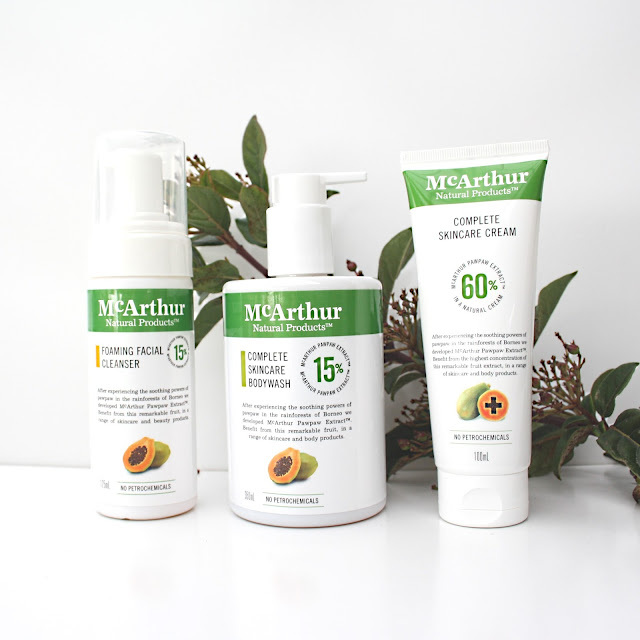 McArthur Natural Products are an 100% Australian owned and made company founded back in 2010. 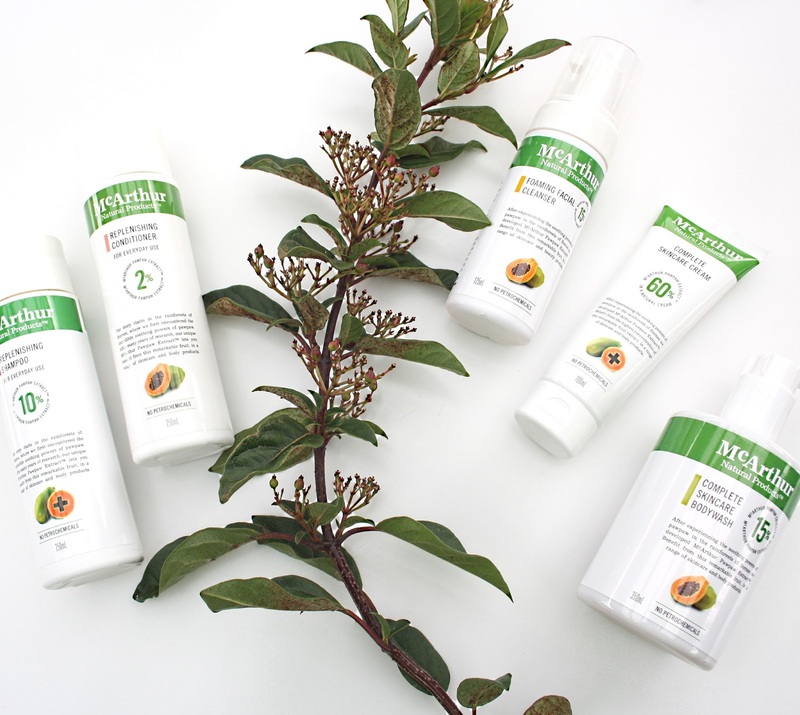 All products in the McArthur range are packed with natural ingredients, and are free from any parabens, petrochemicals, sulphates, steroids and animal testing. 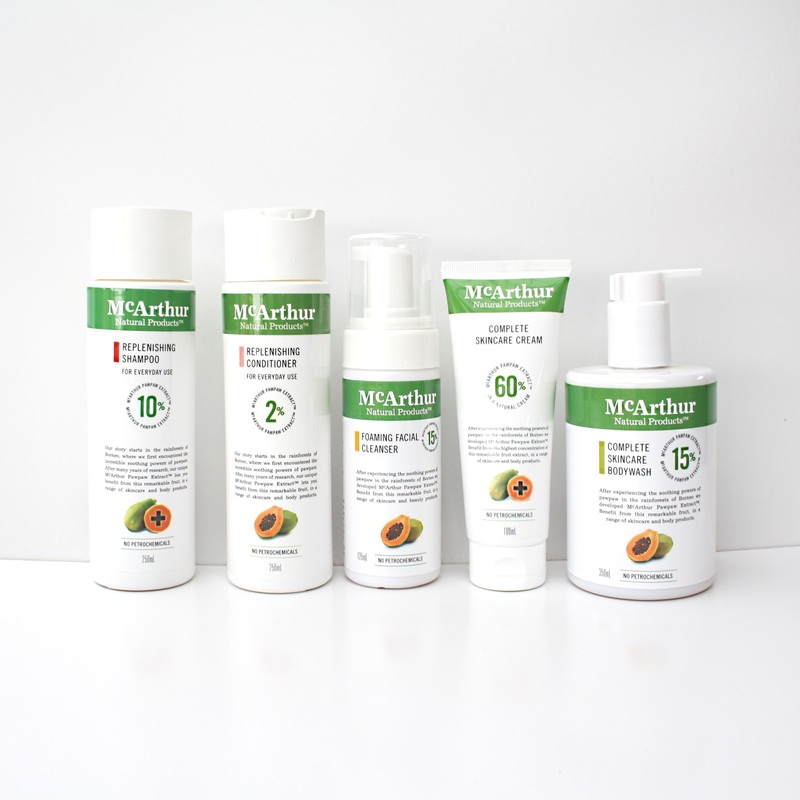 All McArthur products contain pawpaw extract as their feature ingredient. This is due to co-founder of McArthur Natural Products encountering the incredible soothing powers of Pawpaw (Carica Papaya) as he observed local villagers in the remote rainforests of Borneo using Pawpaw for their skin. Pawpaw provides a multitude of benefits for skin and body, including being extremely rich in vitamins A, C and E, antioxidants and enzymes. 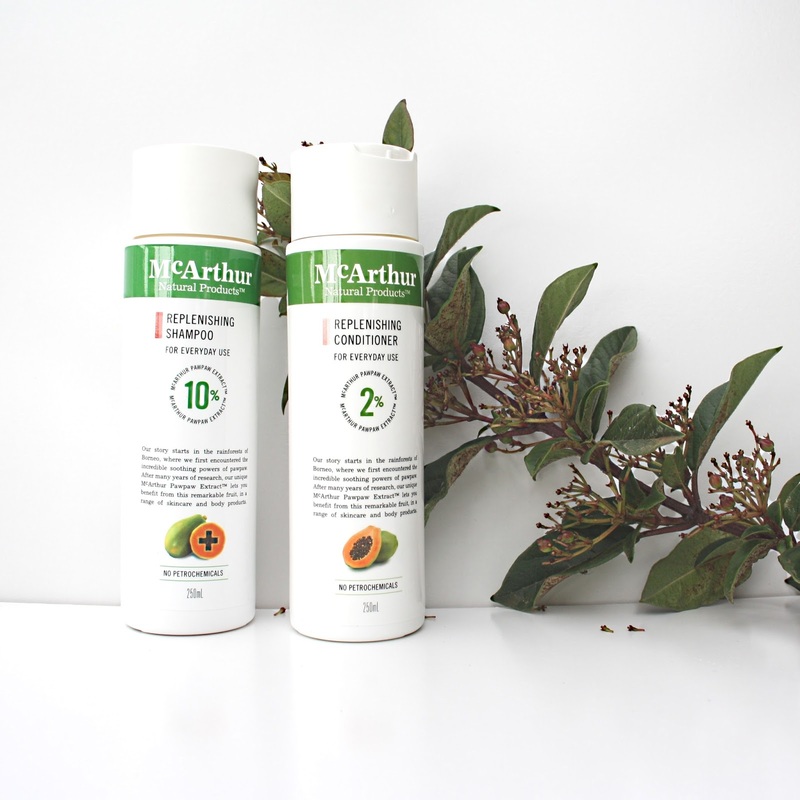 I had only really experienced Pawpaw in the form of that all-time popular red tube of pawpaw ointment, so I was curious to see how McArthur products performed! I haven't used foaming cleansers for quite a while; my dry skin usually preferring cream cleansers. So naturally I was unsure how my skin would respond to this cleanser. I found the way it dispensed as a foam so fun, and it was such a novelty to cleanse my face with. Despite it being (very) foamy, I didn't find it drying to my skin. It was great at removing a face of makeup (I remove waterproof mascara with wipes) and leaving my skin feeling clean and refreshed. This foaming cleanser would be great for all skin types. I'm curious about their cream cleanser which seems like it would be great as well (and I do LOVE cream cleansers!). This cream contains the highest percentage (60%) of pawpaw extract out of all the products in the McArthur range. I love how hydrating this cream is. I have used it all over my body, but I have concentrated on certain areas that need more help than others. For instance, I have applied this on my back to help my skin post-breakout, on the rough patches I randomly get on my upper arms, and on my dry feet. I feel like this cream helps rejuvenate my skin much quicker while hydrating as well. It is a super concentrated formula, so I love that a little bit goes a long way! This body wash gives such a great lather and cleanses while exfoliating at the same time. This body wash would be great for those looking for a natural body wash that doesn't have an overpowering scent. This is a great product to keep in the shower for the whole family to use. I also use this to shave with! I was unsure how I would find this shampoo and conditioner as I have found most natural haircare products in the past to leave my hair tangled and drier than usual (I have dry, LONGGG hair so it needs all the moisture it can get...). I was left pleasantly surprised after using this shampoo and conditioner duo. My hair was left thoroughly cleansed, but not stripped, and nourished. I found it so easy to run a comb through my hair post shower which is unusual most of the time. My hair dried looking shiny, healthy and without any of the heaviness it can get from using haircare containing silicones. I hope in the near future McArthur expand their haircare range and develop a leave-in conditioner/ detangling spray. I would definitely be all over that. 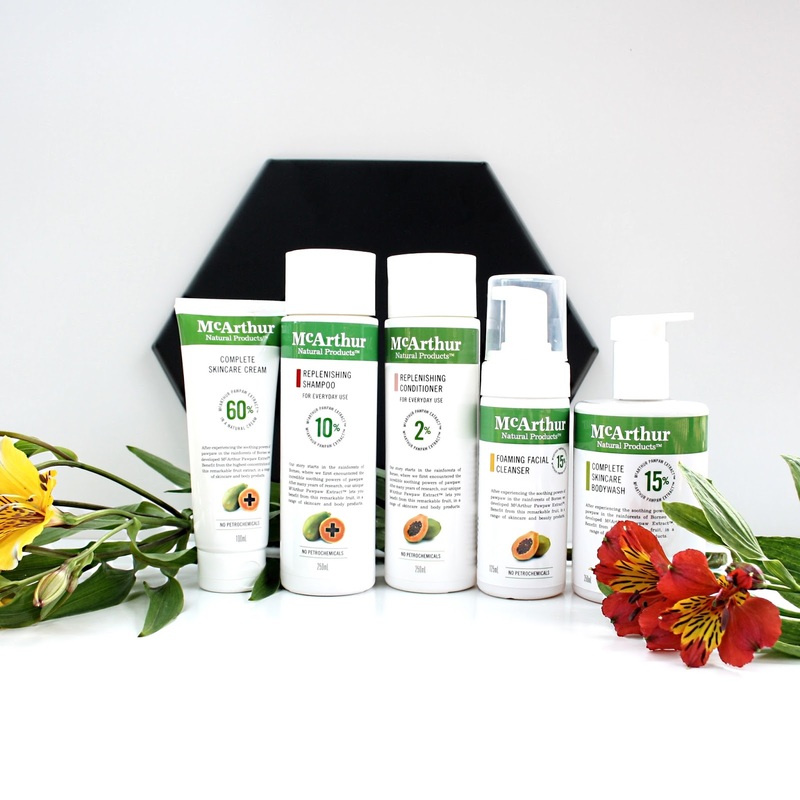 I have really enjoyed trying all of these McArthur Natural Products, and would recommend them highly! All are nourishing to skin to body, and carry a pleasant natural scent unique to McArthur that I presume is due to the pawpaw content each product contains. *This post is sponsored by McArthur Natural Products, however all opinions are my own, as always! I have never tried any of these products but I'm interested in the shampoo and conditioner. It seems to get drier in the winter and then with summer and swimming, my hair is troublesome to say the least. I have the same issue. I have dry hair and these products worked well. It's not summer here yet though! I have never tried the McArthur products but wow they sound so nice!! I am always looking for good natural products to help with my eczema! Absolutely stunning product photography and a great review!